Behind every great diamond is a smart buyer. We believe that the diamond starts with the fundamentals – the 4 C’s. Cut, Color, Clarity, and Carat Weight work together synergistically to determine a diamond’s beauty and its value. The art of choosing the perfect diamond lies in finding the balance between the two. Brilliance: is the reflection of that white light after it hits a diamond’s facets. It is the contrast between these white light flashes and the shadows created by the diamond’s cut. The greater the contrast, the greater a diamond’s brilliance, and the better its cut. Fire: refers to the colors that a diamond’s interior reflects; they’re flashes of color on the visible spectrum that result from the diamond scattering white light into the colors of the rainbow. Scintillation: The amount of sparkle a diamond produces, and the pattern of light and dark areas caused by reflections within the diamond. 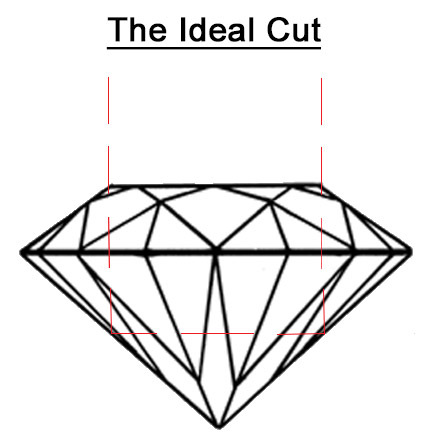 The “cut” grade refers to the diamond’s ability to produce all three with maximum results based on its proportions. Light entering an Ideal Cut Diamond strikes each pavillion facet at an angle that allows the light to reflect back through the crown. The light that passes through the crown facets at a low angle refracts upon exiting the stone. This refraction is a positive aspect of the diamond which creates fire. If the diamond cut is too shallow, the light entering the pavilion facet enters at such a low angle it becomes refractive and passes through the bottom of the stone. When this occurs, brilliance is lost and the diamond appears dark. When diamonds are cut too deep the entering light strikes the first pavilion facet at an angle sharp enough to reflect to the second pavilion, however at such a low angle, it is refracted out of the diamond and escapes. This causes the loss of brilliance and makes the diamond appear dark. Because a diamond’s cut is the biggest determining factor in so many of its other characteristics, Diamonds by Raymond Lee recommends buying the best cut grade you can afford. Diamonds occur naturally in a range of colors, some rarer and more valuable than others – think colored, or fancy diamonds. While fancy colored diamonds are graded on their intensity of color, the white diamond is prized for its lack of color. On the spectrum, diamond color grades are further divided into categories. Beginning with the Colorless diamond grades (D,E,F) then continuing through Near Colorless (G,H,I,J), Faint Color (K,L,M), Very Light Color (N-R) and Light Color (S-Z.) The GIA color scale above shows the range in which color is absent to color being visible to the naked eye. A diamond’s clarity grade is based on the presence or absence of identifying characteristics in or on the diamond. These two different types of marks, fissures, crystal formations are divided into inclusions – internal characteristics – and blemishes – external characteristics. The rarest of diamonds have perfect clarity, and are internally and externally flawless, with no characteristics or flaws. The majority of diamond have some degree of imperfections, although the diamonds used in jewelry typically have very small or even unnoticeable flaws. Most diamonds’ flaws can only be seen through a loupe – a jeweler’s’ tool that magnifies to 10x. Diamonds are graded on a scale of Flawless to Included, depending on the amount, size, nature and location of the characteristics. When it comes to diamonds, most people value one of The 4 C’s above all others: carat weight. A carat can be divided into 100 “points” weighing 2 milligrams each. Jewelers often refer to diamonds in points, for example a 1.5 carat stone, or a .75 carat stone. These are easy examples of a “one and a half” carat diamond and a “three quarter carat” diamond, but using the precise “point” carat weight when discussing, say, a .34 carat diamond helps us be more specific. While carats do refer to a diamond’s weight, most people use them to discuss a diamond’s size. It’s true that diamonds with higher carat weights can appear to be (and often are) larger than a diamond with a smaller carat weight. However, a diamond’s proportions will also affect its appearance. 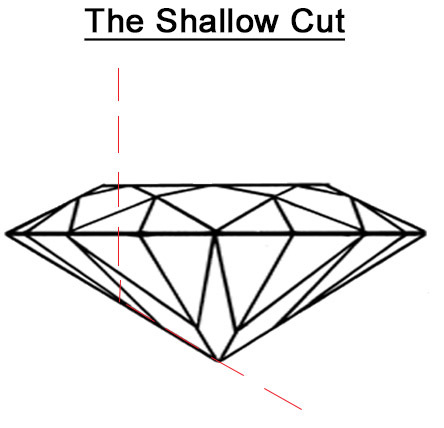 A diamond cut too deep will hold more of its mass at the bottom of the stone, where it can’t be seen. Likewise, a diamond cut too shallow may gain a few millimeters when viewed face up, though it will sacrifice fire and brilliance to nab those extra millimeters. Table – The top facet of a diamond that creates the flat part of the diamond’s “face up” appearance. The table’s size in relation to the diamond’s overall size helps determine brilliance and fire. 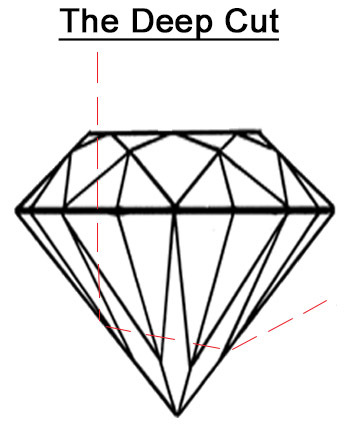 Depth – The imaginary line measuring a diamond from its top (table) to bottom (culet.) The depth, divided by the diamond’s width, determines its depth percentage. This affects brilliance and scintillation. Culet – The bottom facet of a diamond, most often a point. On a modern round brilliant diamond, a flat culet is undesirable. On fancy shaped diamonds and antique cuts, it can provide positive characteristics. Crown – The top half of a diamond – all the facets above the girdle. It includes the table. Crown Angle – The measurement of degrees between the table and girdle. This angle determines how much light will be reflected into the pavilion and back up through the crown. An angle too steep will reduce a diamond’s sparkle. Too shallow, and it will make the diamond seem “flat” rather than brilliant and flashing. Girdle – The thin edge of a diamond where the top part (crown) meets the bottom part (pavilion.) Described as extremely thin to extremely thick, and affects the diamond’s price and durability. A girdle too thick adds carat weight that you won’t see, but you will pay for. A girdle too thin makes a diamond more susceptible to chips. The sweet spot is towards the middle of the grading scale. Pavilion Angle – The counterpart to the crown angle, it is the measurement of degrees between the pavilion and the table. Pavilion – The bottom half of a diamond – all the facets below the girdle. It includes the culet. This is where most diamonds hold the majority of their carat weight. A diamond’s truest sign of beauty – its sparkle – relies on three specific factors. The ideal combination of these produces the ideal diamond. These measurements can be used to further refine your diamond search, specifically when comparing two diamonds of equal cut grade. Because the Cut grade already takes these measurements into consideration, they should never be the sole factors you use to judge a diamond. 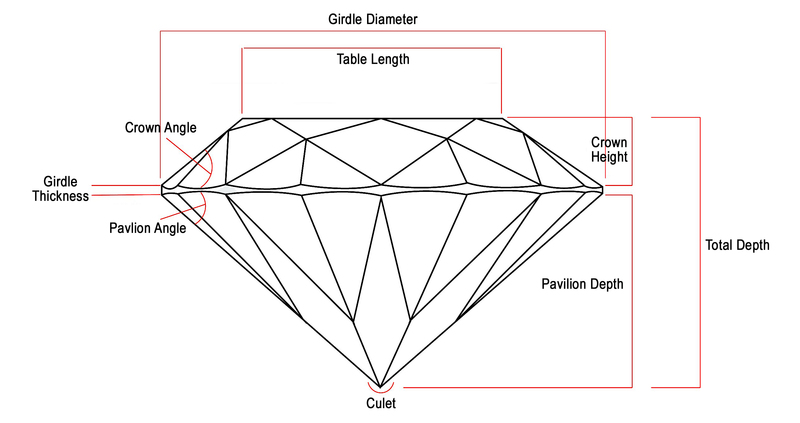 Depth is the measurement from a diamond’s top (table facet) to bottom (culet.) It is expressed as a percentage, and works with other measurements of a diamond’s facets to determine its proportions. The proportions of a diamond refer to the relationships between table size, crown angle and pavilion depth. While a huge variety of angles and measurements are possible, specific ones create a diamond that interacts with light more beautifully. A diamond cut too deep or too shallow will allow light to escape from the diamond’s sides and bottom facets. A well-cut diamond will direct the light through its crown. The table measurement refers to the dimensions of the diamond’s top facet in relation to the stone’s overall diameter. The table width divided by the overall diamond width = the table percentage. A percentage too high means the table is too large, and will likely result in a flat, glass-like diamond. No polish defects visible at 10x magnification. Any defects are extremely difficult to see at 10x magnification. Any defects are difficult to see at 10x magnification. Defects are noticeable at 10x magnification, and may be visible to the naked eye. Defects are visible to the naked eye. A diamond’s certificate is its report card, reflecting each of the 4 C’s, plus the extra details like measurements and traits like symmetry and fluorescence. A diamond is certified once it is sent to a third party gemological grading lab, submitted to inspection by one or more gemologists, and receives a unique identification number and report. It is then sent back to a retailer for sale with “proof” that it is what it purports to be. However, grading labs vary greatly in their quality control, standards for each of the 4 C’s, and grading criteria. None are held to any objective standard. Comparing diamonds graded by different labs is like comparing apples to oranges – one lab’s G color may very well be another’s J color. And a certificate does not denote a better quality diamond. It simply is a third party’s opinion of what the diamond’s characteristics are, and it does often mean a slight increase in price for the diamond, due to the expense of the certification process. While certificates can be a useful tool, especially when shopping online, they are no substitute for a trustworthy jeweler, an educated shopper, and seeing the diamond with your own eyes while discussing its characteristics in depth. The most respected independent laboratory for grading Diamond is GIA, the Gemological Institute of America, which is the world’s largest laboratory. GIA is the world’s foremost authority on diamonds, colored stones, and pearls.